How to Achieve Capital Protection And Still Remain Invested in Market? The fear of loosing capital in market is one of the major reasons for Indian retail investors to keep themselves away from market. Let me share a step-by-step process to remain invested in market with 100% capital protection. We will use a debt fund to invest the lump sum amount of money and then return from the debt fund goes into equity fund. Depending on the risk appetite, the percentage of investment in debt fund can vary. For least risky choice, I use 80 % in debt fund, moderate risk is with 66% in debt fund and for more risky profile, I use 50-50 split. Let us understand by taking a real life example. I have selected Franklin IGSF Composite as debt fund. It has not given very good returns in last 5 years but still I think it is completely ok to be selecting an averagely performing fund so that we don’t over exaggerate on returns. For calculation sake, we will use 200,000 investment in debt fund and 50,000 in an equity fund. A capital of 200,000 remains completely safe in debt fund and your investment in equity fund can help you beat the returns. So lets put thing into actual data and see how it unfolds. We assume our investment starting date as 1st January 2009 and the dividend from the debt fund Franklin IGSF is invested the next day into a large cap equity fund HDFC Top 200. We start with an investment of 2.5L. We put 200,000 into Franklin IGSF and 50,000 in HDFC Top 200 fund. 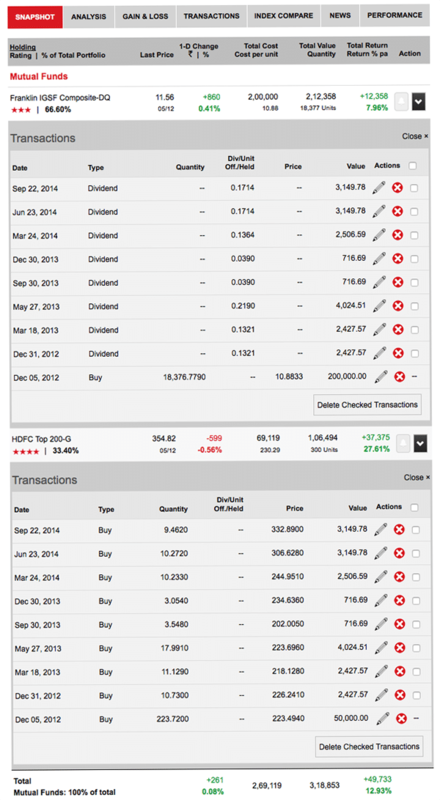 The return from dividend of FIGSF fund goes as top up into HDFC Top 200 fund. If we add all the transaction details with dividend from a debt fund being invested into equity fund, the snapshot of the portfolio will looks like this as of today 5th December 2014. There are couple of things to note in the above screenshot. The return from the debt fund is under 5% per annum but if you look at the overall portfolio return, it is above 11%* per annum. So with the split of even 80 % in debt and only 20% in equity along with return from debt fund re-invested back in equity fund can boost your overall return of your portfolio by a big margin. We started with only 20% of asset allocation into equity but slowly but surely it has moved up to 56% of asset allocation into equity investment. This process helps us improve our asset allocation in equity and still protect capital erosion in market. *Note: Overall return of 11.71% shown in the above figure is wrong for our calculations because it takes into account the date and amount we invested into the equity fund. So the return of 14.62% in equity investment is based on investment done over a period of time but that investment is actually a return from debt fund. So the calculation is based on total investment of 299,007 over a period of 6 years and not based on 2,50,000 that we started with. In real terms we have not invested anything apart from the initial investment of 250,000. We just switched funds for better returns but the switches being in different fund the calculation is not completely accurate. For more accurate calculation the formula is (482045-250000)*100/(250000) which is roughly 16% per annum. Consider exactly the same scenario but we invest 66% or 200,000 in debt and 33% 100,000 in equity to start with. The portfolio changes as follows. You can see that the asset allocation of 33% in equity has increased to 68% and of course as we have more investment in equity fund, the overall return is expected to be much higher. 5% return from debt fund is tripled to around 14+% and also note that this 14% return is actually 27%* per annum. What happens when we start at 50-50 split? As expected the equity allocation has increased from 50% to 80% and returns are above 17% (actual return is above 50%*) per annum. Note that in 6 years the amount is 4 times. We have selected a debt fund that has given subdued returns but you can always opt for an FD to get better than 5% returns. 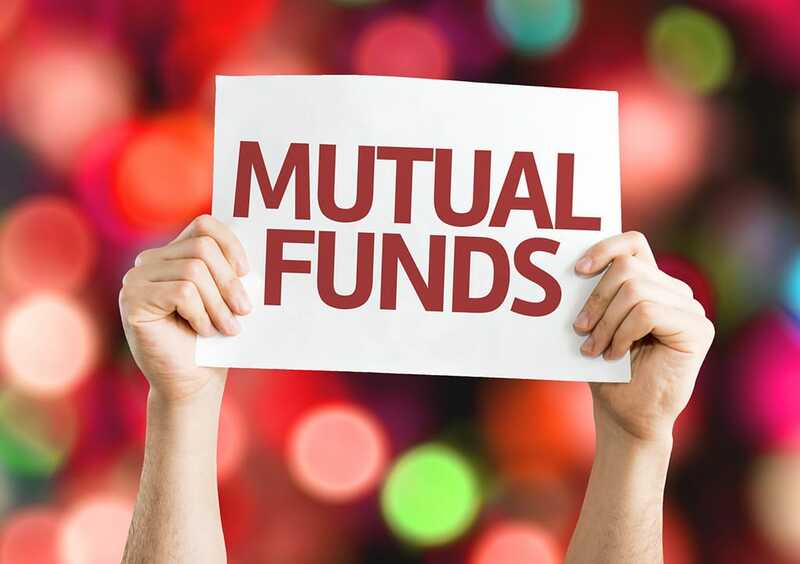 Still I have selected a debt fund because the returns from a debt fund as dividend is tax-free and returns from FD may be subject to tax calculation as well. What happens when applied to shorter time frame? The process is ideally suited for long time frame investment i.e. more than 5 years but it can always be applied for shorter time frame as well. Same concept when applied for 2 years i.e. from 5th December 2012 to 5th December 2014. Return of just under 8% from debt fund return has increased to 12%* (which in absolute terms is 14%) and 20% asset allocation in equity has increased to 33% in the 2nd year itself which helps in overall performance of the portfolio in the longer term. You can opt for an asset allocation that suits your risk appetite and generates a better than expected returns on your investment. 80% in debt and 20% in equity asset allocation is very helpful in capital protection as well as generates better returns but you can also opt for a 90% in debt and only 10% in equity as well to get started. Are you still afraid of market for capital erosion or you are not confident of able to protect your capital and still remain invested in equity? Share your views in comments below. You are here: Home / Mutual Fund / How to Achieve Capital Protection And Still Remain Invested in Market?